A luxurious and spacious, single storey house located just one hundred metres from Four Mile beach in the Beachfront Mirage gated community. It is designed to be enjoyed at all times of the day and throughout the year, either "indoor" (on hot summer nights, with everything closed and air con on full), "indoor / outdoor" (evenings, allowing for cool breezes to flow through the house but free from insects), or "outdoor" (with everything opened up... most of the time). The lounge, living areas and gourmet kitchen are open plan, offering clean views through to the outdoor entertainment and pool area. The kitchen is well designed with plenty of bench space, quality appliances and cupboards stocked with a full inventory of crockery, glassware, cutlery and cookware. This retreat features four large, stylish bedrooms, each with their own en-suite. In the lounge is a large plasma TV with Foxtel and DVD plus a wireless internet connection. 29 Beachfront Mirage has a 9 x 4 metre heated swimming pool and large outdoor covered area for tropical dining....with ducted gas barbeque. A property that offers quality without pretension. Thank you for taking the time to write a review for 29 Beachfront Mirage, Lee. 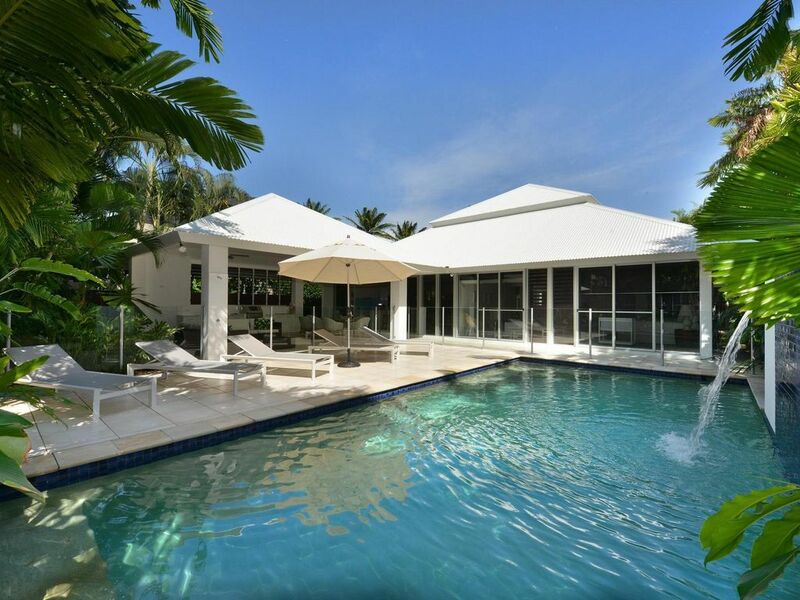 We have just returned from a wonderful 8 days in Port Douglas, staying in this beautiful home. We travelled as a family with our three sons and one of their partners. Everyone had their own space (and bathroom, makes for no fighting over the first shower!) and we all loved the home. We spent most of our time in the outside lounge/dining area adjacent the pool - so comfy and great to have the built in bbq and sink. Most meals were cooked outside and all meals were enjoyed around the outdoor dining area. The pool was the perfect temperature and a great size for swimming and playing. There was nothing more we needed from this lovely home. All linen was supplied, the furnishings were comfortable and stylish and easily accommodated the 6 of us and 4 guests we had over for dinner on the first night. The louvred screens provided great cross ventilation and with ceiling fans, we did not need to use the air conditioner for the entire 8 days. The kitchen was well appointed with every utensil I needed to prepare a meal provided. Located within a gated estate, security is great too. It's an easy walk into Macrossan Street and the beach is just a short stroll away too. Whilst home is where the heart is, you could easily leave your heart here! Hi Carolyn We are pleased you enjoyed your stay at this lovely, newly updated family home. It is perfect for a large group, with each bedroom having an en-suite and sounds like the pool & entertainment area were well used - Even in winter! Thank you for leaving 29 Beachfront Mirage clean and tidy on departure too. We look forward to welcoming you back again!